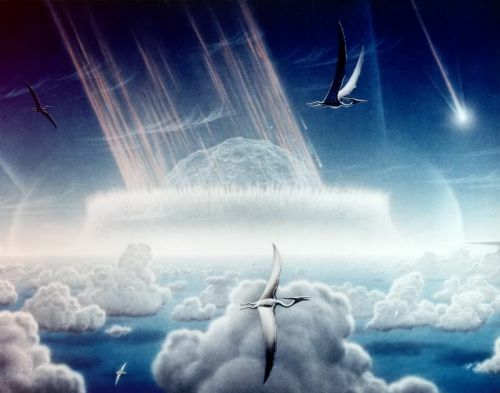 65 million years ago (mya), there was a mass dinosaur extinction caused by an asteroid impact. You've probably heard that statement before. Of course, young earth creationists—who constitute a large percentage of fundamentalist Christians—believe the earth is only 6 thousand years old. So why does science claim that there was a dinosaur extinction caused by asteroid impact 65 million years ago? Earth's history is marked by several mass extinctions. Probably the best-known of these is at the so-called Cretaceous-Tertiary boundary, about 65 million years ago, the catastrophe that wiped out the dinosaurs and many other terrestrial and marine species. All over the world, samples of the sediments that were deposited then show traces of iridium, an element that is rare on Earth but common in asteroids, pointing to a massive impact. Scientists have found that the earth has layers. The life forms represented by the fossils in those layers are different than the life forms alive today. By dating rocks from various layers all over the world—though some places, due to geological events, don't produce datable rocks—scientists have been able to put together dates for each of those layers. Dinosaurs appear in the Triassic, Jurassic, and Cretaceous layers but not before or after. What caused them to suddenly disappear? This very attractive theory was supported by … 39Ar/40Ar ages of about 65 ± 0.2 Ma of melt glass in the Chicxulub breccia and impact ejecta in the form of glass spherules (microtektites) in Haiti and NE Mexico. The quote right above this sidebar, believe it or not, is from a web site disagreeing that the Chucxulub asteroid caused the dinosaur extinction. They argue that the crater was formed 300 thousand years (that's 1/2 of 1 percent of 65 million years, a very small difference) before the dinosaur extinction. They base this, it appears, on evidence from life activity (tunneling, etc.) right around the Cretaceous-Tertiary extinction line. Don't bother reading it yourself unless you're a scientist. It's difficult wording, but the link is there if you want to give it a go. They do, by the way, agree that the dinosaurs went extinct 65 mya. They also agree an asteroid caused it. They just don't agree it was that asteroid. I know what you're thinking. You're thinking, "Huh???" What that says is that the melt glass formed by the impact of the asteroid on the Yucatan peninsula dates to 65 mya, plus or minus about 200,000 years. Wow. That's when scientists dated the dinosaur extinction based on the geologic column and radiometric dating. There's More: The "Iridium Anomaly"
An anomaly is "an oddity; inconsistency; deviation from the norm." Amazingly—coincidentally—there is an iridium anomaly right at the 65 million year mark in the geologic column. All around the world "sediments that were deposited then show traces of iridium, an element that is rare on Earth but common in asteroids" (see above). Predicted age vs radioactive dating age chart of supposed errors found by creationist John Woodmorappe. Amazing consistency, isn't it? And those are the errors! So the next time you someone asks you why scientists say, "65 million years ago, mass dinosaur extinction was caused by an asteroid impact," tell them it's all based on coincidence.